On a clear Saturday afternoon, my daughter, mother and I made an appointment to stop by one of our delightful Finger Lakes farms, Finger Lakes Dexter Creamery on Black Rock Road, south of Aurora. The farm is part of the Finger Lakes Cheese Trail and is located between Poplar Ridge and Ledyard Roads. They are also a stop on the Finger Lakes Sweet Treat Trail. The drive through the fields and wooded areas of the Finger Lakes is always wonderful. Rose Marie Belforti, who also serves as the Town of Ledyard Clerk, and her husband are the busy cheese makers. The farm is 12 acres with 7 in pasture. They make Kefir cheese on Monday, Wednesday and Friday. You should call ahead for a time to visit; their cheese is available for sale at the farm. A group of four folks from NH and SC also joined us as we were greeted by Rose’s English Shepherds, a beagle and a few chickens. Rose must open the gate for you and her “door bells” are quite attentive. We headed over to the tasting room which has simple, almost Shaker décor and Karl Larsen prints. The table and stools were made by a fellow from Ithaca out of re-cycled wood. Clean and simple lines. I must warn you that we like “stinky” cheeses in my family. 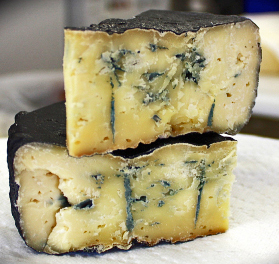 We eat Bleu, Roquefort and Gorgonzola spread on crackers, tossed in salads, mixed into quiche - anywhere we can think to add it. We like a cheese with bite – and these were good. The delicious Finger Lake s cheeses were humbly displayed on thick wooden “plates”. This is a very special type of cheese made from Kefir which is an ancient process coming from the Turkish meaning well-being. Kefir “grains” made of lactic bacteria and yeast are added to the milk to start the fermentation process. Rose joked that the “mother” is supposed to have come from Biblical times; we are eating what might have been manna. It is probiotic and has micro-bacteria. There is real science to cheese and experts from Cornell University assisted with the developed of farm and the cheese recipes. Rose explained that Kefir cheese is labor intensive and that this farm is the only one in the country. Today, they use milking machines and bucket milkers. There are additional buildings which house the cooling room and extra storage. The milks all comes from the herd of about 20 Dexter cows which are small cattle originally coming from Ireland. Her herd are registered Pure-bred Dexter cattle. Rose harvests the meat and milk; they can also be used as draft animals. 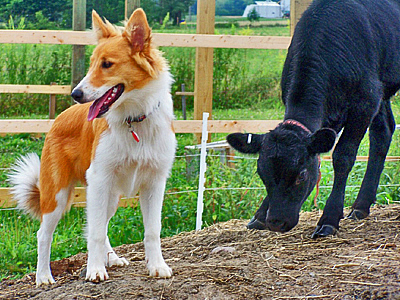 She and her cows have a special relationship that she greatly enjoys – and hopes they do to. Rose also makes several favors of jams including peach-blueberry along with a grape preserve and takes orders for fruit and berry pies and other baked goods. They regularly sell at the Ithaca Farmers’ Market. We also had the great pleasure of going into her 1870 farm house to see a litter of puppies. I am glad they are all spoken for or one might have gone home with me. Alas, I do not have a working farm and these are dogs which must herd and work due to high energy. Though we did not see it, the temperature controlled cave” is in the basement where the cheeses are aged to perfection. Finger Lakes Dexter Creamery, is additionally a stop on the Finger Lakes Sweet Treat Trail. Pick up your Sweet Treat Trail Tasting Tour Pass at the farm or one of the other 28 stops and enjoy the tastes of Cayuga County. Visit the booth at TomatoFest on September 7 & 8 at Emerson Park to win a basket of Sweet Treat Trail goodies. As an added bonus - down around the corner is one of the most magnificent trees I have seen in a long time. Head west on Ledyard Road toward Cayuga Lake and it is on the north side of the road. It stands alone and has a perfect shape. Can you name the species?